Well over 100 years ago, when Winnipeg was in its infancy, there stood a blacksmith's shop at the north west corner of McDermot Avenue and Rorie Street. Owned by John W. Aikins in the 19th century, it was sold to William Camerson around 1900, who subsequently sold it to James Porter and Company. 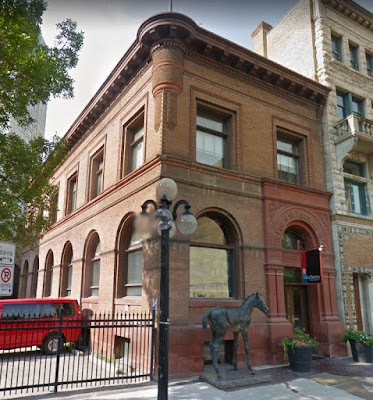 James Porter and Company would replace the blacksmith's shop with the Porter Building in 1906, a six story warehouse that still stands proudly in Winnipeg's historic Exchange District over 110 years later. 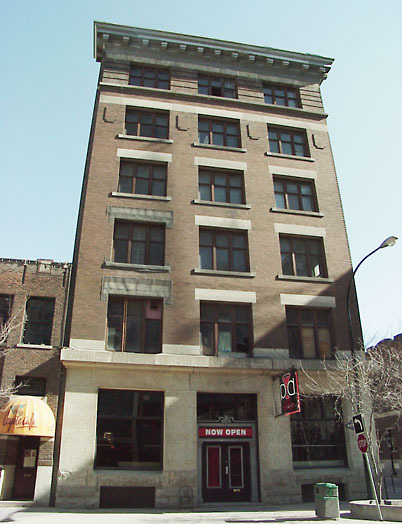 In 1985 it was added to the City of Winnipeg's List of Historic Resources, recognizing its significance and protecting it from demolition. Today it is an outstanding example of adaptive reuse, taking an historic building and breathing new life into it with a new function while maintaining its historic integrity. 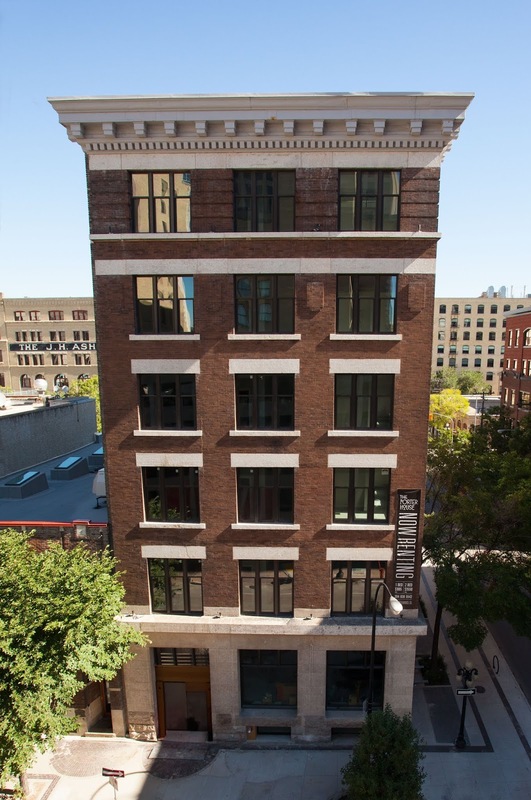 The Porter Building at 165 McDermot Avenue in 2018. Source: Alston Properties. 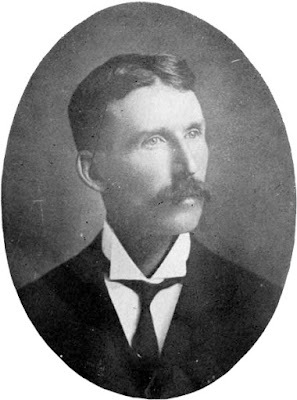 James Porter had arrived in Winnipeg from Ontario in 1881 as a 29 year old. Taking advantage of Winnipeg's booming economy, central geographic location and excellent freight rates, Porter founded a crockery and china firm. Needing space for his new business, in 1902 Porter hired architect John H. G. Russell to design his a building at 368-370 Main Street, near the intersection with Portage Avenue. Porter quickly found success in importing bulk quantities of wares that were then repackaged and sold to prairie clientele in western Canada. Success meant that Porter soon needed more space than his Main Street location could offer, and so he purchased the blacksmith's shop at 165 McDermot Avenue and started construction of a new building in 1906. 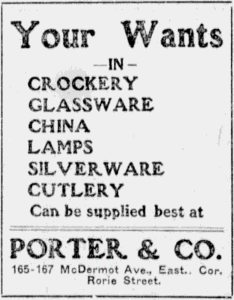 Advertisement for James Porter and Company at their original Main Street location from June 23rd, 1906. Source: Winnipeg Tribune. 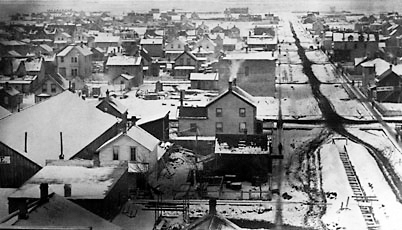 McDermot Avenue looking west from Main Street in 1881. Source: Archives of Manitoba and Virtual Heritage Winnipeg. Apparently pleased with Russell's design of his first building, Porter again hired the architect to design his new building. 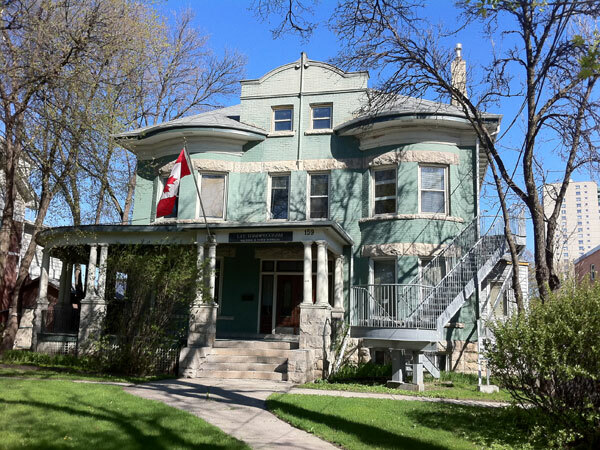 Russell was an architect from Ontario who came to Winnipeg prior to the turn of the century, eventually becoming the president of the Manitoba Association of Architects (1910), president of the Royal Architectural Institute of Canada (1912) and the preeminent architect in the city. 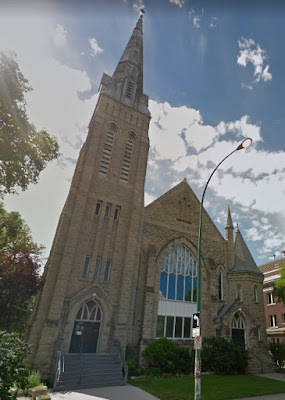 By the time Porter commissioned Russell to design his second building, Russell had already designed over 30 buildings in Winnipeg including the Lake of the Woods Building (1901, 212 McDermot Avenue), the McArthur House (1903, 159 Mayfair Avenue), Augustine United Church (1904, 444 River Avenue) and the Carnefac Block (1905, 188 Princess Street). Russell was an adaptable architect, designing buildings in a variety of styles and for all different types of use, capable of tackling any type of project. John H. G. Russell, in 1902, the architect of both of James Porter and Company's buildings. Source: Representative Men of Manitoba and the Manitoba Historical Society. The Lake of the Woods Building, July 2017. Source: Google Maps. Augustine United Church, July 2017. Source: Google Maps. Carnefac Block, April 2004. Source: Virtual Heritage Winnipeg. For Porter, Russell designed a six storey Chicago School style building with brown brick on the McDermot Avenue and Rorie Street facades, red brick on the other two and a rough stone foundation. A modest building, the main entrance was centered on the McDermot Avenue side, and flaked by display windows. The ground floor facade on McDermot Avenue and the front half of Rorie Street is dressed in limestone, which is further used as an accent on the building. Each floor of the McDermot facade has an identical set of three triple windows, with limited single windows on the Rorie Street facade and a consistent pattern of single windows on the back facade. The west facade had no windows and was used for advertising, some of which is still visible today. The sixth floor of the building is highlighted with brick detailing on the two main facades and topped by a grand dentil cornice made of metal and wood. 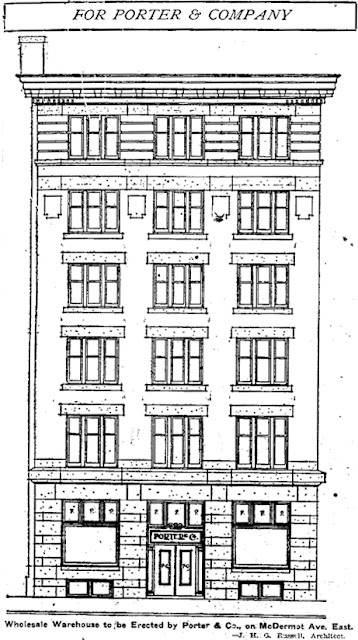 Architect's drawing of the Porter Building. Source: Winnipeg Free Press. The interior of the building housed showroom space, offices, storage and service areas with a single freight elevator located in the back of the building by the two loading docks. Russell purposely designed the building so that is could easily be converted from warehouse space to office space, with generous natural light coming in both the front and back of the building. When finished, the building cost approximately $38,600 to build and is a clear departure from the other buildings on the street. It was nearly twice as tall as it neighbours and not built in the previously popular Richardson Romanesque style, which is typified by round arches and large, rough masonry. James Porter and Company remained in the building until the company was dissolved in 1943. 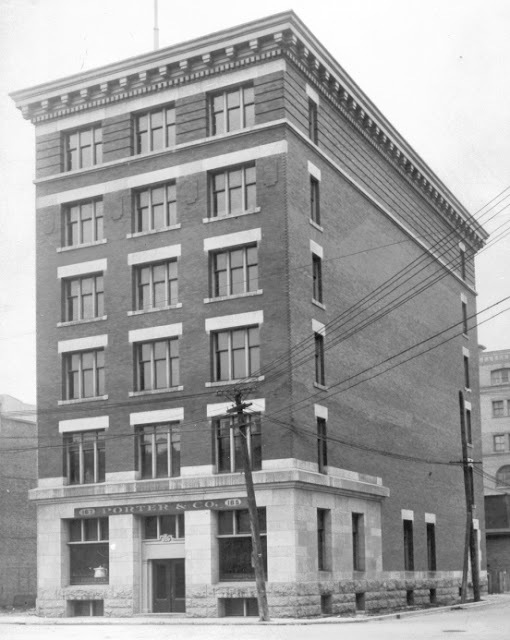 The Porter Building in 1907. Source: Archives of Manitoba. 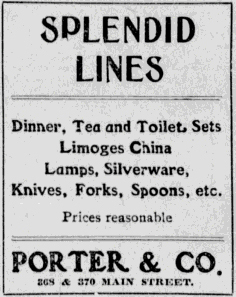 Advertisement for James Porter and Company in the new McDermot Avenue location from April 19th, 1907. Source: Winnipeg Tribune. After the departure of James Porter and Company, various other companies took up residence. Sanford Evans and Company Limited was a research, statistics and direct mail firm that shared the building with the Galpern Candy Company. The Galpern Candy Company was a family company the produced fine candy and Milady brand chocolates. 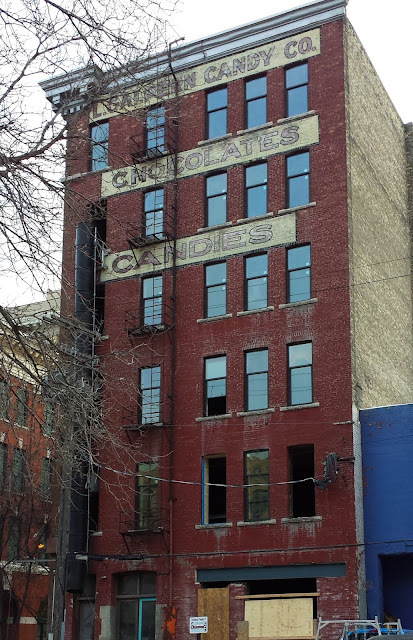 With advertisements painted on both the west and back facades of the building, the Galpern Candy Company became synonymous with the building, with many people knowing it only as the Gaplern Building. When the Galpern Candy Company folded in 1973, Willson's office furnishings department moved in and used the building as a supply depot. Willson's eventually left the building, leaving the top five storeys of the building empty since 1975. 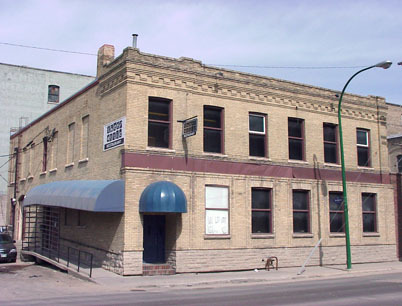 The building's final occupant, a nightclub, left the main floor and basement in 2004 resulting in the entire building being vacant. 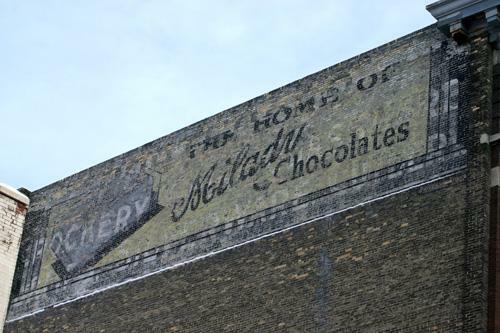 An advertisement for James Porter and Company crockery shines through a later Milady Chocolates advertisement on the west facade of the Porter Building. Source: Canada's Historic Places. Advertisment for the Galpern Candy Company on the back of the Porter Building. Source: Alston Properties. The Porter Building with its last tenant in 2004. Source: Virtual Heritage Winnipeg. 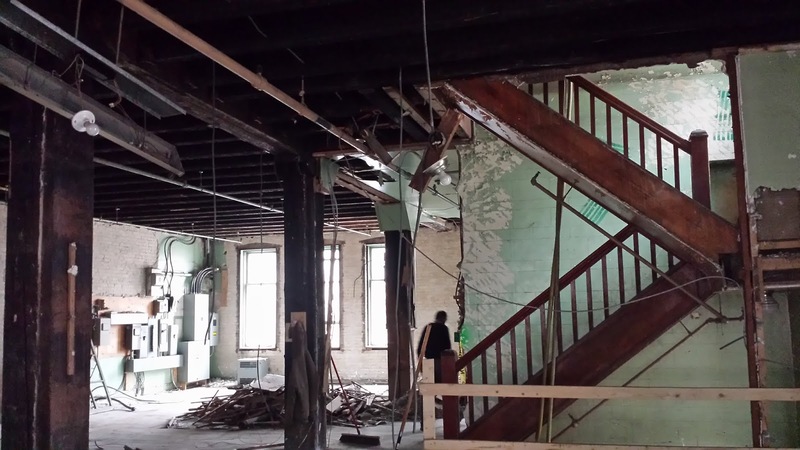 In 2015, Alston Properties, a family owned development firm based in Victoria, took over the Porter Building with the intention of converting it into residential units. The interior of the building was gutted, the front entrance was moved to the west side of the McDermot Avenue facade, 50 new windows and several new entrances were added to the Rorie Street facade. 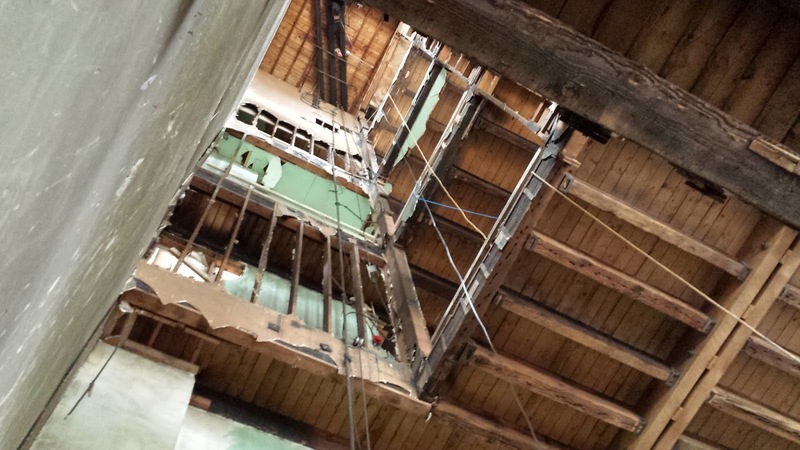 The top five floors of the building were converted into 30 one bedroom apartments, at approximately 500 square feet each. The ground floor and basement were converted into four two storey townhouses with individual entrances, each being 1,100 to 1,200 square feet in size. The history of the building was highlighted by exposed brick and wooden beams. Topping of the renovations was a rooftop deck with views of the Exchange District. Renovations were completed in 2018, with the building rebranded as the "Porter House". The interior of Porter Building under construction. Source: Alston Properties. 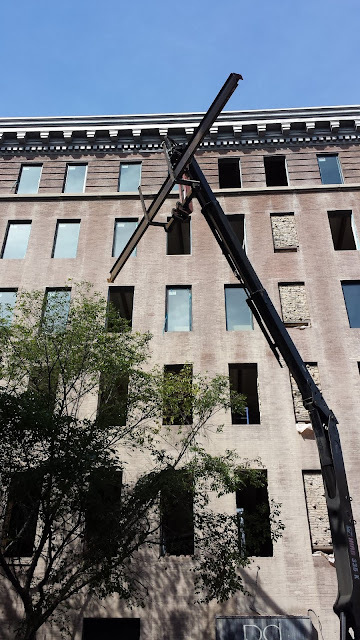 New windows added to the Rorie Street facade of the Porter Building. Source: Alston Properties. The interior of the newly renovated Porter Building. Source: Alston Properties. The exterior of the newly renovated Porter Building. Source: Alston Properties. The Porter Building is an excellent example of the adaptability of historic spaces, making them functional and desirable for modern uses. Anchoring the intersection of McDermot Avenue and Rorie Street, the renovations to the building take advantage of the original architects intent to design a flexible building, and do not compromise the building's contribution to the historic streetscape. 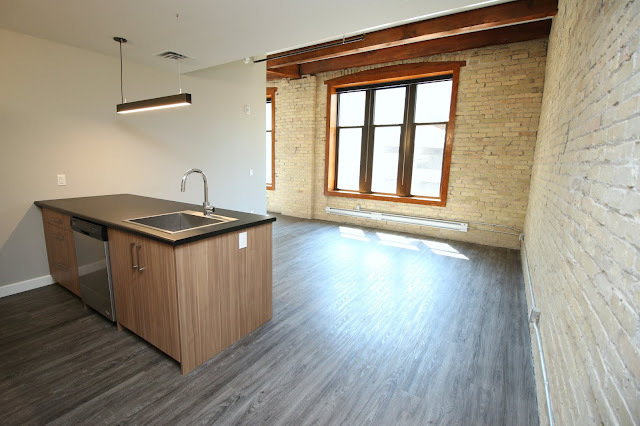 Heritage elements inside the building are embraced and celebrated, adding desirable character to the new units. The building now provides much needed housing to Winnipeg's downtown while contributing to environmental sustainability by reusing a building instead of demolishing and replacing it. 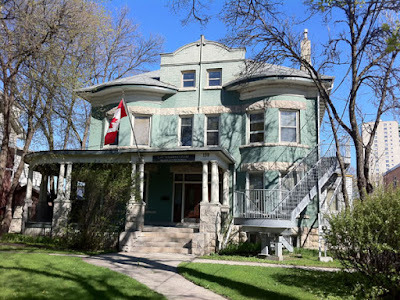 It has now been nominated for a 2019 Annual Preservation Award, which recognize the people and building projects that are dedicated to the protection, restoration and conservation of Winnipeg's built heritage. 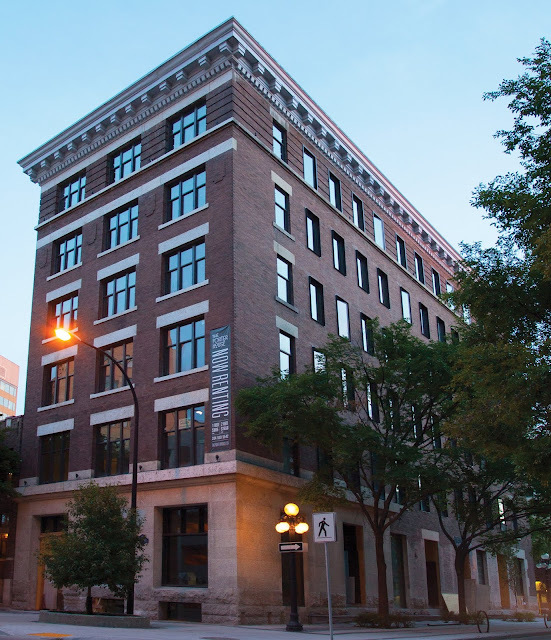 The Porter Building is a heritage success storey, demonstrating the true potential of heritage buildings when creative, environmentally conscious ideas are allowed to flourish and make meaningful contributions to their community.